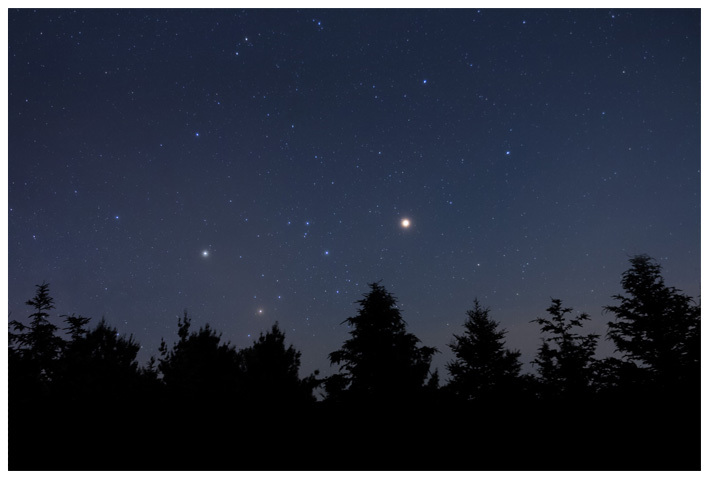 If you have ever taken a long exposure astrophotography image of the night sky using a DSLR camera with a high ISO setting, you’ll know all about the negative effects of noise. An image that looked great on the display screen of your camera may appear quite different when you look at it up close on your computer screen. Thankfully, there are proven ways to reduce noise in your low-light, long exposure shots. 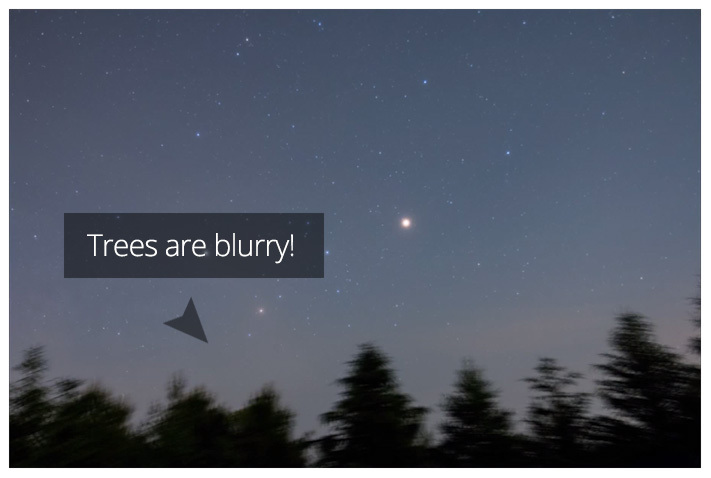 The (not-so-secret) trick is to take several shots of the same area of the night sky and blend them together using a technique called stacking. When you reduce the amount of noise in your images, you benefit from an improved signal-to-noise ratio. A stacked image will have a much “smoother” background and improved image quality overall. 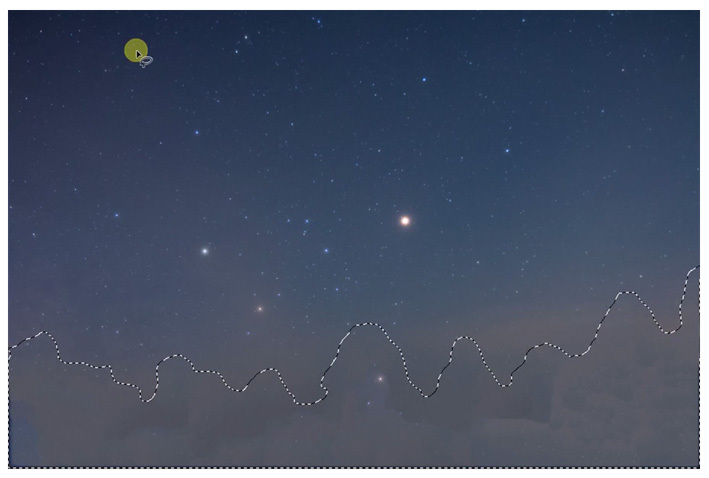 It can really make your life easier when processing an astrophotography image because it allows you to perform aggressive curve and level adjustments without destroying or clipping the data. 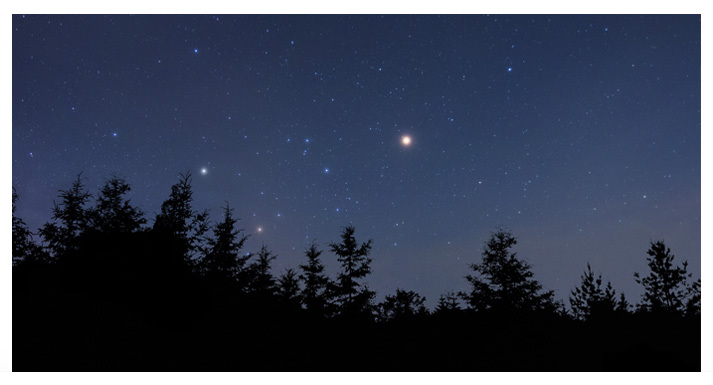 There are several software tools that will automatically align and stack your images together, including my personal favorite, DeepSkyStacker. However, you can also perform this technique using Adobe Photoshop manually, or with the built-in stacking script. The noise reduction technique I will describe on this page involves the manual method, where you will align and place each exposure on top of each other in layers. Although this method may take a little longer, it’s a great exercise in the concepts of signal-to-noise ratio, and you have complete control each step of the way. The first piece of software I will be using in this tutorial is Adobe Bridge for file organization and selection. 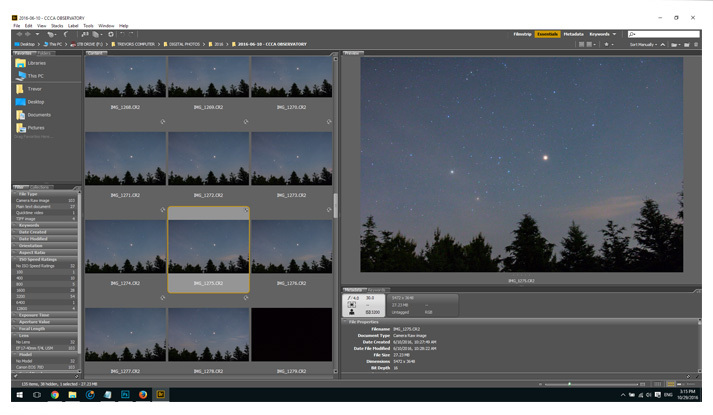 For DSLR astrophotography images in RAW format, you’d be hard-pressed to find a image explorer than Bridge. Once I have reviewed and sorted the image exposures I would like to stack, I bring the images into Adobe Photoshop for further image processing. 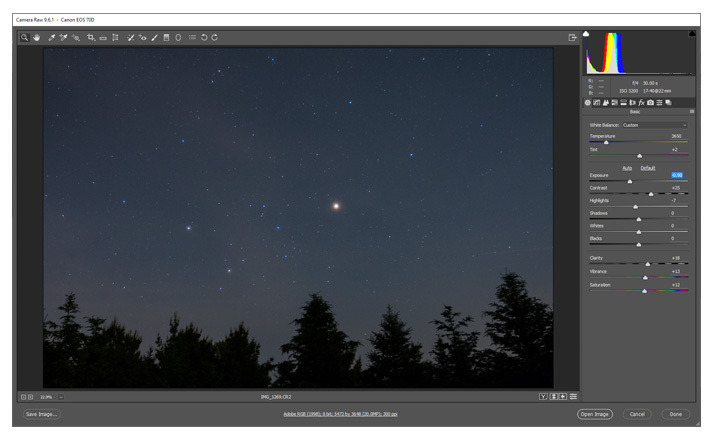 In the video below, I’ll explain how to apply settings to your astrophotography images using Adobe Camera Raw. Certain adjustments can really help your photo stand out in a crowd. The contrast, dehaze and vibrance sliders have the biggest impact in my opinion. For a written description of the techniques used in the video, continue reading below. First, preview the images you plan on stacking in Adobe Bridge. For a successful processing session, I recommend stacking a minimum of 10-12 exposures. In this example, each individual exposure was shot at ISO 3200, and were 30 seconds each. 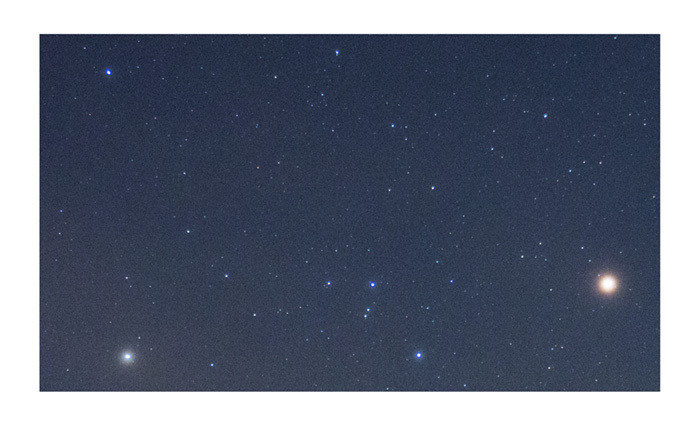 This is a typical exposure length and ISO for any night photography image. The photos were captured using a Canon EOS 70D DSLR camera, and a Canon 17-40mm F/4L Lens. It is important that each image is taken with the same orientation. Apply your desired settings to one of the images in your image set. (Don’t go crazy with the noise reduction – we’ll take care of that later) Once you are happy with the look of the single frame, you can copy the settings and apply it to all other frames in the set. 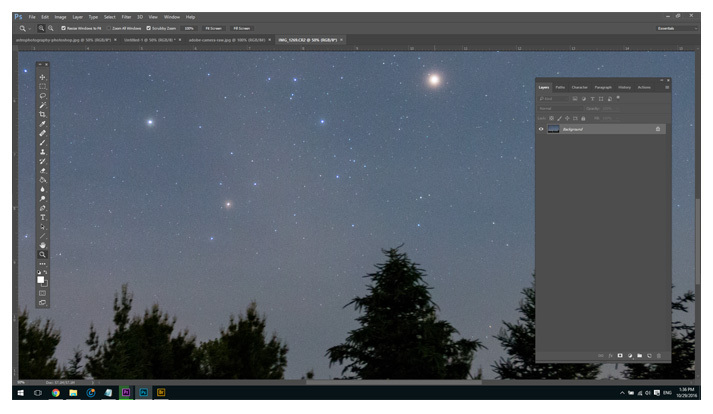 In Adobe Bridge, right click on the processed image, and select Develop Settings > Copy Settings. Then right click on each image in the set that you would like to apply the settings to. This will effectively give you a group of exposures with the exact same adjustments made. These are the files you will be aligning and stacking in Adobe Photoshop. Your first image frame will be very noisy, as we have not yet combined any images with it. By layering the image with several others, you will increase the signal-to-noise ratio. 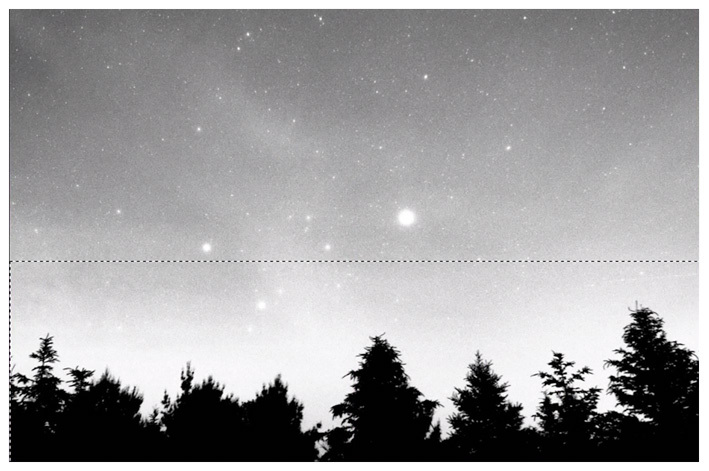 This means, that the signal (The stars in the image) will remain bright, and the noise (The pixelated background sky) will become softer and less crunchy. The next step is to open your second image file in the group in Photoshop. Then, select the entire canvas, copy it, and paste it on top of your first image. It may be helpful to name your original layer at the bottom. Continue copying and pasting each image frame from the set onto a single layered file. Once you have combined all of the image files as layers in a single file, you can begin to adjust the opacity of each layer. This is the key to a well-blended master file. Of course, the number of image frames used will vary. The idea is to gradually fade the exposures out until you reach the top layer. This way, the light collected by the camera sensor has been retained, while the background noise has virtually canceled itself out. When the layer opacity adjustments have been made, you can then flatten the image for further processing. It is wise to save the Layered Photoshop file as well, in case you want to make any edits later. If you have avoided any landscape elements in your image (just the sky), your image should be nearing completion. However, if your photo contains foreground objects such as mountains, trees or roads – your landscape has shifted dramatically! To fix this you will need to separate the sky from the foreground. If the area between the sky and the Earth is too complex, you may want to leave it as is. Many beautiful astrophotos have been left this way. In our example, removing the blurry trees is a simple task. We can then add in a single layer for the treeline, one that is sharp and not blurry. Choose a single frame from your image set, and process it using Adobe Camera Raw. The goal is to create a black and white silhouette version of the tree line. The more dynamic contrast between the trees and the sky, the easier it will be to blend into your image. Cut this area of your black and white version, and paste it on top of your layered master file. Turn this layer off for now, as we need to remove the existing blurry trees first. Using the lasso tool, draw around the trees or motion-blurred landscape in your image. Use either the content-aware fill or healing brush methods described in the video to remove the trees. Select the Healing brush tool. Hand down the alt key, and click an area of the sky you wish to replicate. Without holding the alt key, click the healing brush tool in the area you wish to replace. With the foreground area removed, we can then paste in the solid black tree silhouette image we created earlier. Make sure to cover up any strange areas created by the foreground removal process. This concludes the tutorial on how to manually stack exposures in Adobe Photoshop. I hope that you have enjoyed this example, and now have a better understanding on the subject. 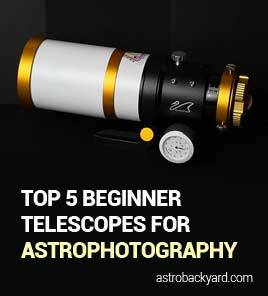 Follow AstroBackyard on Facebook for the latest information and photos.